What are the 2018 Global Relocation Trends? What are the major 2018 global relocation trends shaping the industry? As workforce mobility and employee relocation continues to increase, several trends change how clients respond to increasing employee requirements regarding their relocation needs. Also, global changes in how employees are able to accept transferee assignments, such as limits on working visas and work permits, further impact company plans for mobility. Our team of global relocation experts have identified five key trends that are shaping 2018 Global Relocation. As companies continue to expand globally, the need for a mobile workforce to accept transferee assignments has increased exponentially. Along with this mobile workforce, services designed specifically for spouses and partners have become increasingly important to employees. Spouses and partners are critical to ensuring transferee success. It is important for clients to provide support and information specifically for spouses and partners to help them with their relocation process. Specifically, pre-decision support, an online job search and assistance portal, and professional career services are important programs and services for spouses and partners. Transferees can be secure in the knowledge that their spouses and partners will receive as much assistance as they need to be successful in their new location. Global relocation programs need to provide enough flexibility to anticipate and provide for challenges and opportunities that are unique to specific locations. Many multi-national clients have designed a corporate-level relocation program, which then is further customized for each international headquarter location. Relocation programs designed at the corporate level need to provide for a multitude of options and differences across locations. Our recent Case Study on Implementation Success Factors describes in detail the importance of identifying all stakeholders and engaging them early in the process to ensure implementation success. Countries are increasingly placing limits on the number and types of working visas and work permits that allow transferees to enter the country legally for work assignments. Some countries such as the United Kingdom have seen the number of applications exceed the monthly quota. Other countries such as China have changed requirements and set up a Working Permits Points System that emphasizes transferees with specialized knowledge. The United States has instituted travel restrictions for specific locations, and has increased enforcement of immigration requirements. As countries around the world respond to migration challenges, the impact on global relocation programs will continue to evolve. Global relocation programs continue to respond to evolving technology changes. Increasingly, mobile technology must be responsive to provide transferees with information and solutions during their relocation process when they need it, wherever they are located. Transferees should be able to get information on the go, and upload expenses for quick reimbursement. Mobile enhanced relocation technology solutions such as MyRelocation should be available, as it is platform-responsive and able to be accessed anywhere, making it the most useful solution for a mobile workforce. Global relocation programs must cover a wide array of specialized issues such as tax, visa applications, and compliance reporting. Furthermore, it is to a client’s best advantage to consult with experts who have knowledge and experience in the specific aspects of these areas as they relate to global relocation programs. Companies can benefit from an outsourced solution that specializes in unique relocation needs. Working with relocation experts who have extensive experience in these and other areas can help a company avoid risks and respond more effectively to transferee’s requests for guidance and advice. Thoroughly reviewing your global relocation policy and benchmarking to industry best practices keeps your company at the forefront of your industry peers, reinforces employee satisfaction, and promotes successful relocations. 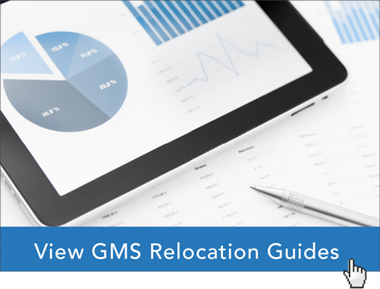 The global relocation experts at Global Mobility Solutions (GMS) have the knowledge and expertise to help your company remain at the forefront of 2018 global relocation trends, and offer your employees the best relocation experience. Contact our team of experts to discuss your global relocation policy needs, or call us at 800.617.1904 or 480.922.0700 today. What are the 2018 North America Relocation Trends?